Das Logo von dr.knusper, der neuen Marke für vernünftige Genießer. Our dr.knusper team aims combing naturalness and functional food. Unlike usual protein products we refrain from unsing artificial flavours at all. Instead you’ll get real taste from real chocolate and pure hazelnut-pulp. 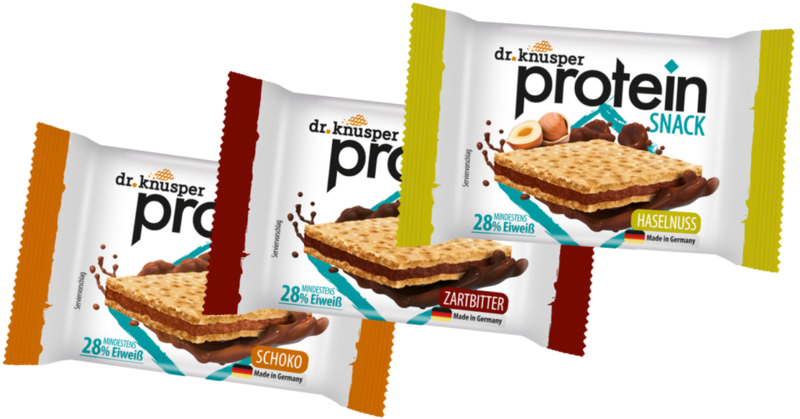 Dr.knusper protein snacks are backed in our own waffle backery in Berlin according to highest quality standards. That’s why we stick to IFS Version 6. Moreover we carfully choose ingredients. Therefore we strictly handle milk protein from excusive choosen experienced german supplyers (Made in Germany). The tasty confluence of milk protein and waffel with whole-grain flour for more enduring power! We are conscoiusly using palm oil, because we have the considered opinion of palm oil having nutritionally advantages compared to potential alternatives. Whereas we was just trying to minimize its utilization in our reciepts, beacause we want to reduce the ecological effects of its worldwide increasing consumption. Milk protein is suitable for the demand of even the most ambitious sportsmen and woman, because milk protein contains WHEY protein as well as casein. Moreover our protein snacks contain the low in allergens collagen hydrolysate as structural protein in the extracellular space. We use exclusively high-quality resources produced by established and certified manufacturers. All of our products are fabricated completly in Germany under Intenational Food Standard (IFS) Version 6. Im Vergleich zu herkömmlichen gefüllten Waffeln sind dr.knusper Protein Snacks deutlich zuckerreduziert und haben weniger Fett. Damit kannst du dr.knusper ohne Reue als kleinen Knusperspaß auch mal zwischendurch genießen! Auch Mona N. liebt dr.knusper wegen seiner Ausgewogenheit der Nährwerte. Sie hat den Snack sogar auf Ihrer Alpenüberquerung dabei gehabt. Just delicious and not too sweet. Best companion on my crossing of the Alps. A perfex nutrition mix with way more protein. Den Kunde Sebastian N. erinnert der protein Snack etwas an Filinchen. Möglicherweise durch die Ähnlichkeit des Waffelblattes. Geschmacklich ist auch er überzeugt. This small waffle is great… Really crunchy and its taste is extraordinary and rich. Die Kundin Hugine W. beschreibt dr.knusper protein SNACK als ihre Lieblingswaffel. "Ess ich am liebsten!" I like them best !